PBSC Urban Solutions' Bixi bikes at a neighborhood station in Montreal. They're made by Devinci in Chicoutimi, Quebec. 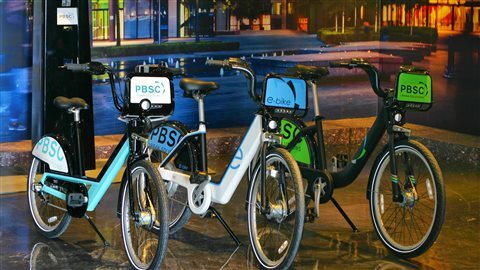 PBSC Urban Solutions is the Montreal-based company behind the bicycle many cities around the world are choosing for local ride-sharing. It now has almost 50,000 bikes and 3,500 stations in 15 citiew and on two university campuses worldwide. PBSC stands for ‘Pubic Bike Sharing Company’. CEO Luc Sabbatini acknowledges it’s not the most clever name when it comes to branding, but in the industry, it’s a respected straightforward identity for a company that has collected awards and contracts for its innovative system. The original bixi bike was designed by renowned industrial designer Michel Dallaire. It is a solid bike that’s a pleasure to ride. The system employs solar powered wireless terminals, and cutting edge technology, with 30 improvements integrated over the last six years. At the Velo-city World Cycling Conference in Tapei, Taiwan at the end of February, PBSC introduced three new models, including an electric bike, intended for markets in Asia and South America. The bicycles are manufactured under the cycling expertise of Devinci in Chicoutimi, Quebec. Toronto has ordered 1.000 bikes, and 120 terminals selecting PBSC to expand its bike-sharing program. In Montreal, the installation of the stations and bikes getting lined up, has become aother rite of spring. Here it still goes by it’s original name, ‘the Bixi’. The system opened last night at midnight and it’s already surpassed objectives set by Bixi officials. 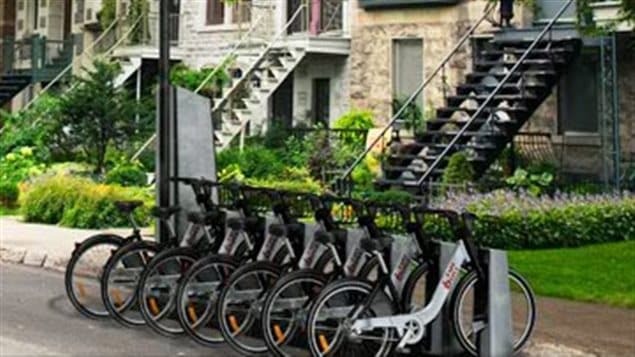 “Our objective was to gain 1,000 new subscribers, and we’ve already reached the 2,200 mark,” Sylvia Morin, a board member for Bixi, told CBC News in Montreal. “A lot of effort was put into making the customer experience a better one. The bikes are always in top-shape condition, we’ve changed the tariffs so that it would be easier to use, but I think it boils down to the customer experience, which has really been improved and the quality of the maintenance of the bikes.” Morin said. Montreal’s Bixi program had 38.000 members last year and provided 3.5 million rides between April and November. In New York City, they’re known as ‘Citi-bikes’ in keeping with the sponsor, Citibank. In two cities in Mexico, Guadalajara and Toluca, they’re known as ‘Mi-Bici’. It’s not known yet, what they’ll be called in Honolulu, Hawaii this summer when their system is up and running.